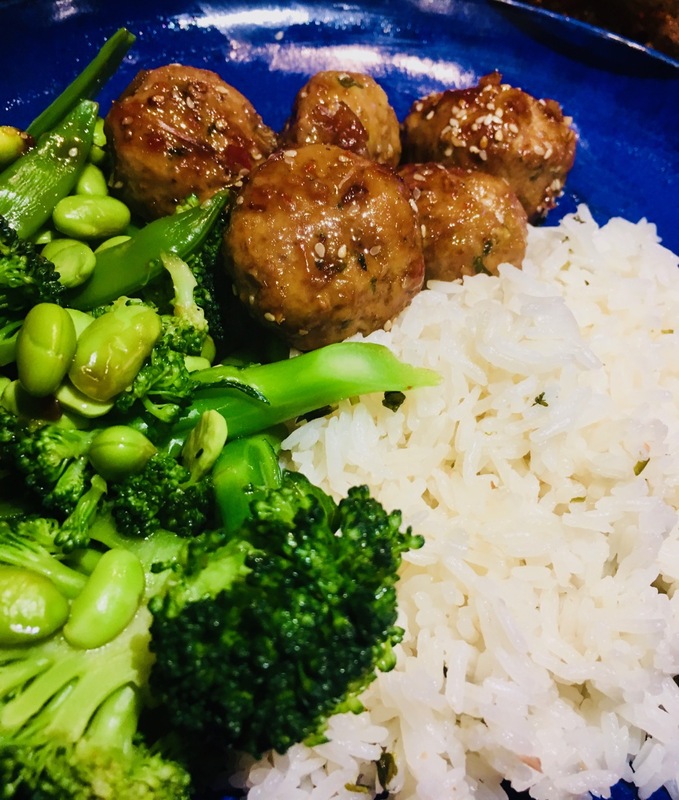 You can make these meatballs with whatever mince you fancy, be it turkey, beef or pork but do take care to buy 5% lean mince where you can. I can never really tell the difference between lean mince and full fat (20%) so this is a painless way of reducing fat in your diet. Another tip here is to oven-bake the meatballs, instead of pan-frying. This not only saves on fat but it’s also easier than standing at the hob and scraping burnt pieces of mince off the surface as your meatballs slowly disintegrate. I’ve made these many times and they’re now a solid favourite in my family; except for one son. There’s always one. We’re almost over the ‘it’s fizzy on my tongue’ years, and I’m trying to re-introduce some heat into our repertiore and this recipe is the perfect way to do that. The spice comes from the sweet chilli glaze, so you can either leave it off or find a really mild sauce. I love serving this up with a mixture of steamed green vegetables that include sugar snap peas, edamame and brocoli. I buy my edamame (or soy beans) frozen and cook them up just like you would with petit pois. I also drizzle some of the glaze onto the vegetables for extra flavour. You can prepare the ingredients from whole (bread, garlic pieces, coriander stems, spring onions etc) in a small food processor as an alternative to preparing them all separately before adding to the mince. Combine all the ingredients in a bowl and mix well. Roll into meatballs and place on a baking dish. Spray or roll around in a little bit of oil. Cook for about 15 minutes, or until cooked. Then turn the oven up to about 200c. Spoon tehe glaze over the meatballs, then roll them around for good coverage, and then sprinkle with sesame seeds. Bake for another 5-10 minutes to get some colour and caramelisation happening. Serve up with rice and steamed greens. Put all the ingredients into a small pot and bring to the boil.